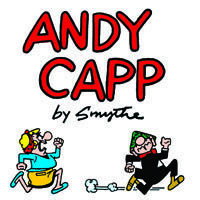 Andy Capp, the irrepressible pub dweller created by Reg Smythe, first appeared in the Daily Mirror newspapers of England in 1958 as a cartoon panel. It quickly became a favorite throughout the country, as readers everywhere could identify with the good-for-nothing Andy and his smart-mouthed wife, Flo. After being converted to strip format, Andy Capp was published in the United States for the first time by the Chicago Sun-Times. Within a year, the cartoon was appearing in 45 newspapers. A year later, that number had grown to 400. Now, after more than 40 years in existence, Andy Capp has grown to be one of the most popular comic strips in the world. It is printed in over 1,500 newspapers in America and around the world, from Russia to Japan, Norway to Sri Lanka. Besides being a popular success, the strip has won numerous awards, including being named Panel Feature of the Year by the Cartoonists' Club of Great Britain five straight times. It has also won the Reuben award for Strip of the Year from the National Cartoonists Society. Andy Capp's appeal goes beyond the newspaper pages, however. In 1982, the cartoon was made into a musical by Manchester's Royal Exchange Theater, and productions were put on in London and all over England. And in 1988, the strip was adapted into a television series by the British Broadcasting Corporation. In addition, Andy Capp's instantly recognizable face appears on merchandise around the world, from commercials to T-shirts to hot fries. In short, Andy Capp has become part of our cultural heritage -- a character children and adults all can instantly recognize and enjoy.